This Beautiful Willow Wand Measures just over 11" (28.5cm) in length with a thickness of 3/4" (2cm) at its widest point which tapers to a soft rounded end. 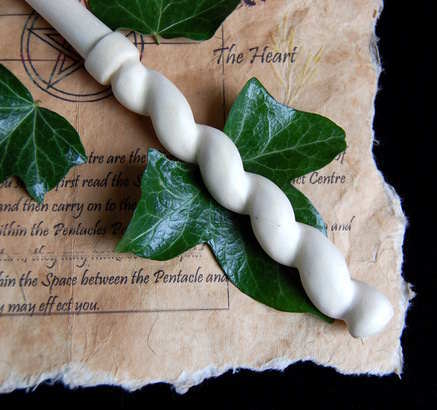 This wand has been Hand Carved by ~Moon Goddess Garden~ with a Unicorn Spiral Hilt which sits comfortably in the Hand giving a strong connection to the Wand. The wand itself has a pale waxed hue and is virtually flawless apart from a few pale apricot markings. 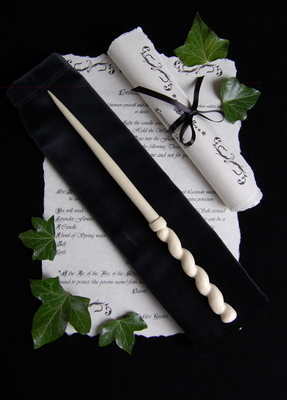 With its Gentle Nature this wand will be well suited to all forms of Luna and Goddess Magic!